On September 25, 2017, Glenn Gould would have been 85. To mark the occasion, the TSO is presenting a tribute concert to him on September 22 and 23 with two works of great significance to his biographical and musical legacy. In July 1982, just weeks before suffering the stroke that led to his premature death on October 4, 1982, Gould began recording Wagner’s Siegfried Idyll in its chamber version for 13 instruments. It was released by Sony on a CD that also included Gould’s own piano transcriptions of other Wagner works, but it was Gould’s role as conductor (of Siegfried Idyll) that caught people’s attention. The recording was stunning in its transparency, rigorous in its controlled Romanticism and finely balanced as a large chamber work. The orchestral version of this piece is one of the programmatic keys to the TSO tribute this month. Remarkably, four members of the current TSO participated in the Gould recording, among them associate concertmaster Mark Skazinetsky. He graciously took the time to fill WholeNote readers in on the nuts and bolts of that historic occasion. WN: What are your memories of the recording sessions of Siegfried Idyll? MS: First of all was the fact that I was going to work with GLENN GOULD himself! It was a hot summer day and he came dressed in a heavy coat, wearing gloves, kind of looking a little strange, but when he started to talk he struck me as being a very kind and friendly, respectful person. WN: How much rehearsal time was there? MS: We didn’t have much rehearsal time but everyone could sense something very special and unique was happening and that made the rehearsal more effective. WN: Do you recall Glenn Gould’s approach? Any specific instructions? MS: Glenn Gould’s approach was very unique. At first we thought that all the tempi were very slow, or slower than we expected. But as we were getting deeper into the music it started to make more and more sense. His interpretation of this piece was so sincere and deeply felt that it “infected” us very much. He was asking for very long lines and phrases and that made the whole piece like one big painting. The end result was amazing!!! I asked Lisiecki about his relationship with Gould and what he thought about Bernstein’s pre-performance words. WN: When did you first become aware of Glenn Gould? JL: I cannot even describe a particular moment when I became aware of Glenn Gould. He seems to have been a part of my musical life from the very start, and is inseparable from it in my view. WN: How has he been important to you? JL: There are many inspirational aspects about Mr. Gould. For one, I love his answers to interviews. They were different, insightful and fun. I also like his approach to making music, and adhering to the principle that if there’s nothing new to say, then there’s no point in performing or recording it. He was also never afraid to break with the tradition, and as a result, completely changed the way the entire world sees and experiences some music. WN: What do you think of Bernstein’s famous words to the audience before Gould and the New York Philharmonic performed Brahms’ First Piano Concerto? JL: I actually think these words could have been spoken at many other concerts, and that it is frankly not a surprise that a conductor and soloist don’t get along. After all, each musician is very individual, and when you add in someone’s personality (their amenability and openness, or lack thereof), musical disagreements do occur. WN: How long have you been playing the concerto? JL: This concerto is actually very new to me, and I performed it for the first time in Warsaw only on August 12. My “debut” with this work was a full immersion, too, with live broadcast on radio, YouTube and TV recording. WN: What is your approach to it? WN: Have you played much Brahms in concert? JL: I have included Brahms in my recitals before, but my closer association is with Schumann. In fact, I recorded one of Schumann’s last works for the piano, his Introduction and Concerto Allegro Op.134 for Piano and Orchestra, which inspired Brahms when writing this concerto. I’m reasonably certain that TSO conductor Peter Oundjian will address the Roy Thomson Hall audience before the Brahms concerto is performed. And I’m also confident that Lisiecki will have a few words to say at its conclusion. The prospect fills me with great anticipation. Again this summer my musical life in Toronto was bound up in the Toronto Summer Music Festival, the first under artistic director Jonathan Crow. This year – the festival’s 12th edition – was primarily a celebration of chamber music performed almost entirely by Canadian-born or Canadian-resident musicians. It was a roster driven by the notion of celebrating Canada’s sesquicentennial. The overwhelming artistic success of TSM was an affirmation of the high level of talent our country has produced. The total audience of 15,000 was a 20-percent increase over last year and included several sellouts and many near sellouts in both Koerner and Walter Halls. I was fortunate to take in 15 concerts, three masterclasses, two open rehearsals, two “Conversations” and two “Kids Concerts,” less than half of what the extensive program offered. Visit www.thewholenote.com for my TSM concert reports. Two of the sold-out programs, “The TSO Chamber Soloists” and the “Tribute to Anton Kuerti,” had a direct connection to Mooredale Concerts (of which Kuerti is artistic director emeritus). The TSO players, under the leadership of TSO concertmaster Jonathan Crow, will open Mooredale’s new season on September 24 at Walter Hall. Crow will be joined by Teng Li, principal viola; Joseph Johnson, principal cello; Jeffrey Beecher, principal bass; Michael Sweeney, principal bassoon; Neil Deland, principal horn; and Miles Jaques, clarinet. Their diverse program features the Françaix String Trio, Nielsen’s Serenata in vano, CNW69, Till Eulenspiegel’s Merry Pranks, Op. 28, by Richard Strauss and Beethoven’s Septet in E-flat Major, Op. 20. The Nielsen is a quintet for clarinet, bassoon, horn, cello and double bass; the quintet arrangement of the Strauss uses similar instrumentation with the violin replacing the cello. Crow was gracious enough to answer several questions about the TSO Chamber Soloists (TSOCS) and the program of the Mooredale recital. WN: What was the impetus behind the origin of the TSO Chamber Soloists? JC: There are a couple of different reasons behind the TSOCS, but foremost for us is a chance to present TSO players in a more intimate setting, as we generally only get to interact with our audiences in a very large space. There is something very special about a chamber music setting that allows audiences to get to know their favourite musicians more as individuals, and also allows us to have a little more creativity in our own interpretations. There is also so much great chamber music repertoire that we want to play, and having the chance to do it with a regular group of TSO players only helps us to feel more connected when we get back to the orchestra! WN: How many concerts do you do over the course of the year? JC: Personally? Too many to count! The TSOCS does four concerts a year at RTH before TSO shows, and perhaps three or four more touring concerts every season. The schedules of all the players are too complicated to allow for much more than this unfortunately. WN: How was the upcoming Mooredale recital conceived? Did it begin with the Beethoven Septet and move outward from there? JC: We like to mix well-known chamber works with other wonderful but lesser known works, and one of the goals of the TSOCS is to feature all the parts of the orchestra, not just the string section! The Beethoven Septet is one of the great works of all time for strings and winds and was an obvious choice for this show, after which we looked at other works that would complement the Beethoven to fill out the program. For this concert we focused on works that would be composed in the same style as the Septet – fun, upbeat music that doesn’t take itself too seriously! WN: How would you characterize the Francaix String Trio? JC: This piece always makes me think of a champagne cork popping out – it’s such a light and bubbly piece! Extremely fun to play, and very enjoyable for audiences. WN: The Serenata in vano, CNW69 by Carl Nielsen is new to me. Can you tell us something about it? WN: Are you playing the quintet version of Till Eulenspiegel? Such a joyful piece. Do you recall the first time you ever heard it? Or played it? JC: Yes! This is an amazing arrangement of one of the great orchestra pieces of all time! I first did it at the Montreal Chamber Music Festival probably about 15 years ago. It’s a virtuosic showpiece for the five players and has all the excitement of the orchestral version, but the intimacy of a chamber ensemble – everything we aim for with the TSOCS! WN: What is your approach to Beethoven’s Septet? JC: We tend to think of Beethoven as a very serious composer, but sometimes I think we miss some of the humour and lightness in his compositions. This piece is truly a serenade, and we like to think of it as something perhaps a little lighter than many of the Beethoven symphonies that we play so much. In a way I think it presents a different side of Beethoven – a side of a composer who wasn’t yet deaf and didn’t yet have any idea about the loss that would inflect so many of his later works. Formed in the summer of 2013 at the Banff Centre for Arts and Creativity’s Chamber Music Residency, the Rolston String Quartet took its name from late Canadian violinist Thomas Rolston, founder and long-time director of the Music and Sound Programs at the Banff Centre. In an interview with Rebecca Franks last October shortly after their big win, and available on BBC Music Magazine’s official website (Classical-music.com), the Rolstons – violinists Luri Lee and Jeffrey Dyrda, violist Hezekiah Leung and cellist Jonathan Lo – talked about their formation. Leung and Lee were students at the Glenn Gould School in 2013 who took their quartet ambitions to Banff’s Chamber Residency Program, where they added Lo and Dyrda. They coalesced permanently during a two-year string quartet residency at Rice University in Texas. Three years later they won the prestigious Banff International String Quartet Competition and took off on a year-long victory lap that will culminate in an appearance at the Banff Centre International String Quartet Festival, September 1 to 3. Their year-long winners’ tour heads down the final stretch with the summer festival season, beginning June 8 at the Montreal Chamber Music Festival where they will be joined by previous Banff International String Quartet Competition victors (2013) the Dover Quartet, in their first joint appearance, performing Mendelssohn’s Octet Op.20. In fact following where else in Canada this tour takes them gives us a glimpse into some of the richness of the Eastern Canadian festival circuit circuit. Heading west from Westben, with their recital on July 24 the Rolston String Quartet find themselves literally at the centre of Toronto Summer Music’s 24-day festival. In an inspired pairing, their program will echo that of the St. Lawrence String Quartet, which opens TSM on July 13. Each quartet will perform their Banff-winning program, which in the SLSQ’s case, was in 1992. “We work a lot on character, colour and sound quality,” Rolston violist Hezekiah Leung said in their BBC Music Magazine Q&A. The Rolstons’ prize-winning program consists of the Ravel, the Beethoven (“Razumovsky” No.2 – “One of our favourites,” according to cellist Jonathan Lo) and Zosha Di Castri’s Quartet No.1. On July 27 and 28, The Rolstons head east again, to the Ottawa Chamber Music Festival where they play a recital program on the 27th and join pop star Kishi Bashi on the 28th for a performance of his 2015 recording, String Quartet Live, which contains the luminous, hook-filled Manchester and a host of recognizable string tropes. (Presumably his latest album, Sonderlust, a disco tribute from the multi-instrumentalist, won’t be on the agenda.) If you do make the trip to Ottawa, or happen to be there already, don’t miss the opportunity to hear other notable concerts at the festival. Angela Hewitt plays three Bach Partitas and his Sonata in D Minor July 20. The brilliant Stephen Hough plays works by Beethoven, Schumann and Debussy on July 23. Patricia O’Callaghan and the Gryphon Trio illuminate songs by Leonard Cohen, Randy Newman and Ron Sexsmith July 27. The Miró, Cecilia and Penderecki String Quartets each give separate concerts, with the latter two joining the Gryphon Trio and friends Hinrich Alpers, piano, Roberto Occhipinti, double bass and Jenna Richards, celesta, for “Kubrick Mashup,” an intriguing concoction hosted by broadcaster/writer Eric Friesen on July 30 and focused on the music of the films of Stanley Kubrick. Kubrick’s use of existing works of the classical canon across the centuries was instrumental in growing the audience for these works. Staying with the indefatigable Rolstons, for their August 6 concert in the historic St. Mary’s Church at the Indian River Festival in PEI, the Rolstons revert to the works they played at Westben a month earlier: Mozart’s first Haydn Quartet, Beethoven’s Op.59 No.2 and Ravel’s Quartet in F. The Indian River venue, considered to be a fine example of the French Gothic influence, was built in 1902 by PEI architect William Critchlow Harris. The use of fir, pine, spruce, maple and birch throughout the building, coupled with Harris’ trademark rib-vaulted or groined ceiling, enhances the site’s quality of sound, making for a fine natural acoustic. Among the other artists appearing at Indian River this summer are the Canadian Brass, one-time piano child-prodigy Anastasia Rizikov (now 17), Patricia O’Callaghan (with her “Canadian Songbook”) and on September 15 – yes, it’s still summer – the captivating pop-jazz stylings of Barbra Lica. Three days later the Rolstons find their way across the mighty Gulf of St. Lawrence and through the Cabot Strait to St. John’s, Newfoundland, for dates at the Tuckamore Chamber Music Festival, where their core touring program of Mozart, Beethoven and Ravel is augmented by R. Murray Schafer’s String Quartet No.2 “Waves” and Andrew Staniland’s Four Elements. Knowing Tuckamore’s artistic directors violinist Nancy Dahn and her husband, pianist Timothy Steeves (who also play together as Duo Concertante), the festival will have a stellar lineup to fill the days between August 7 and 20. The tuckamore tree, from which the festival takes its name, is an evergreen unique to Newfoundland and Labrador, celebrated for its tenacity, strength and special beauty. Like some other summer festivals, Tuckamore has a program for young artists; in fact, Dahn and Steeves will also spend July 16 to 29 on the faculty of the Domaine Forget International Festival in Saint-Irénée, on the St. Lawrence east of Quebec City, before leading their own festival’s educational program back at home. From Tuckamore it’s westward ho (there’s no more east left) to the Gananoque Music Festival, a series of four concerts in a waterfront setting, hosted by former CBC Radio personality Friesen, who chats with the performers as the sun sets over the St. Lawrence River. The Rolstons will perform their summer staple: Mozart, Schafer, Beethoven and Schumann. And last stop before their return to Banff finds the quartet again in Ontario in a rural spot on Georgian Bay near the base of the Bruce Peninsula for the Leith Summer Festival on August 26. Artistic director, pianist Robert Kortgaard, spreads his well-chosen series of five concerts out from July 1 to August 26; the concerts are presented in the sanctuary of the Leith “Auld Kirk,” an “intimate chamber with an incredible sound and ambience.” Duo Concertante performs there a mere three weeks before their Tuckamore Festival begins; the ever-popular Gryphon Trio is given a subsequent Saturday slot before the Rolstons wrap up the festival less than a week before their Banff concerts. Home again, at Banff, the Rolstons will participate in three programs, performing Schumann’s Third String Quartet, Schafer’s Second Quartet “Waves,” Shostakovich’s Piano Quintet in G Minor (with London-based, Australian-born pianist Piers Lane), and Steve Reich’s masterwork Different Trains. Since his second-place finish in the International Chopin Piano Competition in 2015, Charles Richard-Hamelin has been building a burgeoning international career, and he’s also carving an interesting trail across the map this summer. It begins with two Polish recitals in Gdańsk and Katowice, at the second of which he reprises the recent program he performed for the Toronto Women’s Musical Club’s Music in the Afternoon series May 4 at Walter Hall (a concert I attended): Mozart’s Fantasy in D Minor K397; four Chopin Impromptus and three Mazurkas Op.59; four pieces by the Armenian composer Arno Babadjanian; and Schumann’s vibrant Sonata No.1 Op.11. Richard-Hamelin’s sensitivity and unalloyed virtuosity belie his rumpled appearance. At his May 4 concert, he brought an improvisatory quality to the Mozart, occasionally adding grace notes to the manuscript, and a masterful dynamic range contained within a cohesive whole. He brought out the lovely melody of Chopin’s Impromptu No.2 with simplicity and restraint even as he projected the music’s intrinsic freedom. His playing of the well-known No.3 defined “Chopinesque.” The even-more famous Fantaisie Impromptu was well-framed dynamically and rhythmically with its I’m Always Chasing Rainbows tune a lesson in judicious rubato. The first movement of the Schumann sonata brimmed with the excitement of a young man in love; the tenderness of the second movement led into a playful Scherzo that developed into Papillons/Carnaval territory, while the complex, extended finale was at times riven, yet yearning, forthright. The Babadjanian pieces, with their Armenian romantic colourings, ranged from the bucolic to lively, folk-based dance tunes and served as a light contrast to the rest of the menu. It’s a worthy program to hang one’s reputation on over the course of a season. After his Gdańsk and Katowice recitals, Richard-Hamelin stops in Perugia, Italy, to visit his compatriot Angela Hewitt, the artistic director of the Trasimeno Music Festival. She’s planned a “Four Piano Spectacular” for July 1 (Canada’s 150th birthday, in case you hadn’t noticed). With Hewitt and Richard-Hamelin playing alongside Janina Fialkowska and Jon Kimura Parker, the party will include solos, duos and arrangements for four pianos. Back in North America, Richard-Hamelin plays the Waterside Summer Series on July 6. Located on Amherst Island, just west of Kingston, Waterside’s six concerts also include the Triple Forte Piano Trio and the Saguenay Quartet (formerly the Alcan). Three weeks later on July 27, our inveterate pianist takes the stage as part of the star-studded Lanaudière Festival. It’s Lanaudière’s 40th anniversary this summer, and it is a festival that is as wide as it is deep, from the July 1 opening concert, highlighted by Kent Nagano and the Orchestre symphonique de Montréal (OSM) performing Mahler’s Symphony No.5, to the spectacular close August 4 to 6. The closing weekend, for example, begins with Nagano and the OSM accompanying Yulianna Avdeeva (who won first prize in the 2010 International Chopin Piano Competition) in Tchaikovsky’s Piano Concerto No.1, then moves on to Brahms’ Symphony No.2. Saturday it’s the Nagano-led OSM tossing off Mozart’s Symphony No.39 before tackling Fauré’s gorgeous Requiem. Concluding the festivities is a concert version of Wagner’s Parsifal with the Orchestre Métropolitain under Yannick Nézet-Séguin. Richard-Hamelin’s Thursday, July 27, concert is a a carefully chosen program of works by some of his favourite composers: Mozart’s Fantasy in D Minor K. 397, and works by Chopin and Schumann. Not to be overlooked, Lanaudière also offers up a Marc-André Hamelin double bill: July 21, Liszt followed by Schubert’s Impromptus Op.142; July 22, Beethoven’s Emperor Concerto with the Orchestre Métropolitain under the direction of Mathieu Lussier. Hamelin is experiencing a particularly high point at the moment (early May), having just played Carnegie Hall twice in ten days: first with fellow pianist Leif Ove Andsnes to great acclaim, and second at the 40th anniversary concert of the Emerson String Quartet. Meanwhile, our intrepid pianist, Charles Richard-Hamelin, travels back to Ontario, where on July 29 he plays his standard program (having added an additional Schumann work at Lanaudière) at the Elora Festival, founded by artistic director Noel Edison in 1979. Given Edison’s choral focus, the festival is not short on song: Karina Gauvin, Emily D’Angelo, Susan Aglukark, Joni NehRita, Mary Lou Fallis, Gordon Lightfoot and the Elora Singers appear this summer. But so do Angela Hewitt (The Goldberg Variations), up-and-coming cellist Cameron Crozman, the Cecilia and Penderecki String Quartets and violinist Jonathan Crow (July 29, with a program that he will then repeat at his TSM recital two days later). It’s back to his native province for Richard-Hamelin on August 3 to play his summer recital for the last time in Canada (at Musique de chambre à Sainte-Pétronille), before heading west to Parry Sound on August 9, where he dons his chamber music hat for “Three Great Sonatas,” joined by veteran violinist Martin Beaver and cellist Yegor Dyachkov in music by Beethoven, Chopin and Schumann. Festival of the Sound artistic director, clarinetist James Campbell, has assembled a deep roster of instrumentalists for the 2017 edition, which runs from July 21 to August 13. Pianists Alexander Tselyakov and Martin Roscoe, cellist Cameron Crozman, the New Zealand and Penderecki String Quartets, the Gryphon Trio, trumpeter Guy Few, double bassist Joel Quarrington, flutist Suzanne Shulman and harpist Erica Goodman will participate in a plethora of chamber music programming that will undoubtedly thrive in the Georgian Bay air. And by August 11, Richard-Hamelin is back in Montreal playing Gershwin’s Rhapsody in Blue with the OSM led by Kent Nagano as part of the fifth edition of the OSM Classical Spree: more than 30 concerts in four days, August 10 to 13, most 45 minutes in length. Neither Richard-Hamelin nor the Rolston String Quartet is participating in Ottawa’s Music and Beyond, an appealing and intricately constructed festival that runs from July 4 to 17. But just because they are missing it is no reason I should in this roundup! It opens with a recital by the high-powered American violinist Sarah Chang, still in her 30s, having made a seamless transition from prodigy to mature artist. Then come three concerts by the Auryn Quartet, a rare opportunity to hear this exquisite Cologne-based German ensemble. After programs by the Kronos Quartet, the Canadian Brass and the imposing American pianist Garrick Ohlsson, Music and Beyond welcomes back the Vienna Piano Trio for three concerts. Pianist Sergei Babayan breaks the pattern, with a one-off show on July 10, before three concerts by The Revolutionary Drawing Room (who play their late-18th- and early-19th-century repertoire on period instruments). Artistic director Julian Armour should be commended for his fresh approach to programming. The Czech Bennewitz Quartet are also playing three concerts while the Saguenay String Quartet does two and the remarkable Flûte Alors one. Cellists Stéphane Tétreault and Johannes Moser give separate recitals; Eve Egoyan plays Ann Southam and David Rokeby. Mélisande McNabney (daughter of violist Douglas McNabney) gives a harpsichord concert. From the summer solstice to the autumnal equinox, there’s much to see and hear and no better place to do so than in Canada this year. To paraphrase Leonard Cohen’s Beautiful Losers: when music is live, magic is afoot. The Toronto Symphony Orchestra embarks on a seven-concert, five-city tour of Israel and Europe in May, their first overseas tour since the summer of 2014. All told, nine works and two superstar guest soloists (one established, one emerging) will be toured. This is the first time the TSO will visit Israel, performing in Jerusalem at Sherover Hall in the Jerusalem Theatre, Israel’s largest centre for art and culture and at the Charles Bronfman Auditorium in Tel Aviv, home to the Israel Philharmonic Orchestra. Both concerts will feature Israeli-Russian superstar violinist Maxim Vengerov in Brahms’ lyrical Violin Concerto in D Major, Toronto-born composer Jordan Pal’s Iris (which had its successful world premiere at the recent New Creations Festival) and Dvořák’s dramatic Symphony No.7. From Israel, the orchestra travels to Vienna with Vengerov, to be joined there by soprano Carla Huhtanen and the Wien Singakademie for a performance of Boulez’s harmonic soundscape Le soleil des eaux. Bartók’s masterpiece, Concerto for Orchestra, completes the Vienna program. Then it’s off to Regensburg in southeast Germany where pianist Jan Lisiecki takes over from Vengerov as the soloist, in Schumann’s popular Piano Concerto. (Lisiecki’s Deutsche Grammophon recording of the work was warmly greeted when it was released last year.) That concert opens with Oscar Morawetz’s charming Carnival Overture based on tunes from his Czech homeland. Rounding out the Regensburg program, concertmaster Jonathan Crow’s role in Rimsky Korsakov’s Scheherazade is considerable (and available on the TSO’s Chandos recording from 2014) and his wonderful solo playing should be appreciated by this new audience. The Morawetz remains on the program as an appropriate opener for the TSO’s first Prague appearance (at the famous Prague Spring International Festival) where it’s followed by Vengerov in the Brahms and the Dvořák Seventh. The second Prague concert opens with another specific audience nod - Smetana’s Overture to the Bartered Bride followed by Lisiecki’s Schumann and Bartók’s masterwork. The orchestra is dedicating the Prague concerts to former TSO Music Director Karel Ančerl. The tour then wraps up with a visit to Essen in west-central Germany with Morawetz, Schumann and Rimsky Korsakov on the bill. Most importantly, the tour is an opportunity to bring the TSO (and the city) to new horizons and wider attention, re-establishing its European profile and introducing it to Israeli audiences. For a preview of six of the works being toured, check out concerts in Roy Thomson Hall May 3 - Morawetz’s Carnival Overture, Huhtanen in Le soleil des eaux and Crow in Scheherazade; and May 4 - Jordan Pal’s Iris, Lisiecki in the Schumann and the Bartók Concerto for Orchestra. Post-tour, Sir Andrew Davis takes the podium for two programs. May 26 to 28 Beethoven’s Symphony No.7, a rhythmic tour de force and an essential component of the classical canon, is preceded by Grieg’s expressive Piano Concerto with the engaging Jean-Efflam Bavouzet and TSO principal flutist’s swan song, Griffes’ Poem for Flute and Orchestra. June 2 and 3, the Decades Project takes centre stage with a program reflective of the 1930s: Hindemith’s Music for Brass and Strings, Berg’s touching Violin Concerto (with Crow as soloist), Walton’s biblical oratorio Belshazzar’s Feast. It’s a busy month. The Cliburn: Three Canadians are among the 30 competitors in the 15th Van Cliburn International Piano Competition held in Fort Worth, Texas: Algerian-born Mehdi Ghazi, Vancouver-born Tristan Teo and Chinese-born Tony Yike Yang. All three are no strangers to international competition - in 2015 Yang became the youngest prizewinner in the history of the International Chopin Competition. At 18, he’s the youngest participant in The Cliburn, with Teo, at 20, not far behind. The second round held on May 29 and 30 consists of 20 competitors who must again perform a recital of their own choosing not to exceed 45 minutes in length. Only complete works will be accepted and repertoire from the preliminary round may not be repeated. By the time of the semifinal round, June 1 to 5, there will be only 12 competitors left. Phase 1 of the round has each pianist performing a recital not to exceed 60 minutes in length with repertoire consisting of complete works of their own choosing not previously played in the competition. Phase 2 of the round will have each pianist perform a Mozart piano concerto with the Fort Worth Symphony Orchestra conducted by Nicholas McGegan. By the final round, June 7 to 10, the jury process will have eliminated all but six competitors. Phase 1 of the round will have each pianist perform a piano quintet with the Brentano String Quartet. Phase 2 will have each pianist perform a concerto with the Fort Worth Symphony Orchestra conducted by Leonard Slatkin. The pianists may choose any work scored for full symphony orchestra and piano. cliburn2017.medici.tv (which will also host a variety of editorial content in English, Russian, French and Mandarin Chinese). The live stream will also be available at cliburn.org and medici.tv. The jury, chaired by Slatkin, consists of distinguished pianists Arnaldo Cohen, Christopher Elton, Hamelin, Joseph Kalichstein, Mari Kodama, Anne-Marie McDermott and Alexander Toradze. On April 2, I got a sneak peak at Tony Yike Yang’s Cliburn playbook. In the second of the Piano Bravura series at Church of the Holy Trinity, Yang electrified the audience with Beethoven’s Sonata No.30 in E Major Op.109 (which he will be playing in the preliminary round of The Cliburn) and Chopin’s Sonata No.2 in B-flat Minor Op.35 and Mussorgsky’s Pictures at an Exhibition (which he hopes to play in the semifinal round). I for one hope he makes it at least that far. I wouldn’t want to miss the opportunity to be dazzled by the Mussorgsky once again. May 2: COC’s free noontime concerts spotlight chamber music this month beginning with members of the COC Orchestra playing wind octets by Haydn, Beethoven and Jacob followed on May 4 by Schubert’s delightful Octet. May 23 the winners of the Glenn Gould School Music Competition perform. Toronto Summer Music artistic director Jonathan Crow presents a sneak preview of this summer’s festival featuring emerging artists May 24. May 4: Charles Richard-Hamelin gives his first full-fledged solo recital since his silver medal at the International Chopin Piano Competition in 2015. Presented by the Women’s Musical Club of Toronto, his program includes Mozart’s Fantasy K397, Chopin Impromptus and Mazurkas, a selection of Babadjanian and Schumann’s Sonata No.1, an early work reflective of his alter egos Florestan and Eusebius. May 5, 6: Soprano Measha Brueggergosman and pianist Stewart Goodyear lend their star power to “Edwin’s Pops” as Edwin Outwater leads the Kitchener-Waterloo Symphony in an evening of musical humour. May 10, 12, 13: Violinist Aisslinn Nosky leads the orchestra in her curated program of Vivaldi, Handel, Bach and Geminiani. May 26, 27: Mahler’s thrilling Symphony No.1 and John Adams’ setting of Emily Dickinson, Harmonium, serve as the “Grand Finale: Edwin’s Farewell” marking the end of Outwater’s ten-year tenure as the symphony’s music director. May 5: Austrian teenager, violinist Elisso Gogibedashvili, returns to Sinfonia Toronto and conductor Nurhan Arman two years after her first appearance with them when she was just 14. Sarasate’s virtuosic Carmen Fantasy is reason enough to attend. May 6: The Haliburton Concert Series presents the inimitable duo of Guy Few, piano/trumpet, and Nadina Mackie Jackson, bassoon. May 6: Lara St. John joins Gemma New and the Hamilton Philharmonic as soloist in Korngold’s seductive Violin Concerto. May 6: Katarina Curtin’s String Quartet No.3 and Nicole Lizée’s Isabella Blow at Somerset House share the Kitchener-Waterloo Chamber Music Society’s Music Room with Franck’s expressive Piano Quintet in F Minor in a recital by the Cecilia String Quartet (with Leopoldo Erice, pianist). May 17: K-WCMS presents flutist Suzanne Shulman and harpist Erica Goodman in an entertaining program of duets for this unusual pairing. May 24: The K-WCMS Music Room welcomes Israeli pianist Ishay Shaer in a program of Coulthard, Prokofiev and Schubert. Shaer repeats the same program in Toronto four days later. May 12: The Etobicoke Philharmonic Orchestra’s final concert of the season includes Wagner’s majestic Siegfried Idyll, a Vivaldi flute concerto, Tchaikovsky’s fateful Symphony No.4 and the winner of the Young Composers’ Competition. May 13: The Pacifica Quartet concludes Jeffery Concerts’ two-year complete Beethoven string quartet cycle with an early (Op.18 No.2), a middle (Op.95) and a late (Op.132) quartet. May 19: Gallery 345 presents Trio Conventano, an unusual combination of flute (Dakota Martinů), cello (Thomas Beard) and piano (the charming Philip Chiu), in works by von Weber, Gaubert and Martinu. Jun 7: Acclaimed pianist Robert Silverman performs two Beethoven sonatas (No.1 and the great No.21 “Waldstein”) and the four Chopin Scherzos. May 20: The Kindred Spirits Orchestra welcomes Younggun Kim as soloist in Brahms’ echt-Romantic Piano Concerto No.2. Kristian Alexander also leads the orchestra in Sibelius’ glorious Symphony No.5. May 26: Kim gives a free noontime recital presented by Music at St. Andrew’s with a technically demanding program that includes selections from Godowsky’s Studies on Chopin’s Études and Kapustin’s Variations. May 20: Ensemble Made In Canada and bassist Joseph Phillips conclude this season’s 5 at the First chamber music series with music by Bach, Rossini, Kelly-Marie Murphy and Vaughan Williams (the substantial Piano Quintet in C Minor). May 28: The Windermere String Quartet’s upcoming recital includes Mozart’s very first string quartet K80, written when he was 14, and Schubert’s final string quartet, No.15 D887, written in ten days when he was 29. May 29: Associates of the Toronto Symphony Orchestra (in this case, Leslie Dawn Knowles, violin; Gary Labovitz, viola; and Britton Riley, cello) perform Schubert’s 16 songs from Die schöne Müllerin D795 (transcribed for violin and viola) and Beethoven’s String Trio in E-flat Op.3. Jun 5: ATSO presents the Zephyr Piano Trio in works by Haydn, Luedeke, Piazzolla and Brahms. May 31: Westwood Concerts presents “Hearing Double,” music for two clarinets (Michael Westwood and James Petry) and piano (Megumi Okamoto) by Mendelssohn, Poulenc, Krommer, Joplin and more. Jun 3: In collaboration with Sistema Toronto, Ronald Royer conducts the strings of the Scarborough Philharmonic Orchestra in a program featuring cellist Shauna Rolston, young artist Cynthia Ding (violin) and teachers and students from Sistema Toronto performing Tchaikovsky, Popper, Vivaldi, Mendelssohn and Jim McGrath. The New Orford String Quartet, founded in July 2009, takes its name from the trailblazing Orford String Quartet whose 26-year career ended in 1991. The New Orford’s pedigree is impressive: violinists Jonathan Crow and Andrew Wan, respectively concertmasters of the Toronto Symphony Orchestra and Orchestre Symphonique de Montréal; Eric Nowlin, principal viola of the Detroit Symphony Orchestra; and Brian Manker, the OSM’s principal cello. Their concert April 23, the finale of Mooredale Concerts’ current season, is the quartet’s third appearance with Mooredale since 2012. As for me, I first heard Schubert’s Quintet as a teenager, taken to the Eaton Auditorium by an aunt and uncle one fall afternoon. It was played by the Quintetto Boccherini and presented by the Women’s Musical Club of Toronto. I had never before been so moved by a piece of chamber music. Many years and many diverse recordings since, I still relish the opportunity to hear this sublime music live. Music in the Afternoon: The Women’s Musical Club of Toronto’s current season comes to a vigorous conclusion with two very different concerts. The first, on April 6, features the Toronto debut of the Aizuri String Quartet, described by WMCT’s artistic director Simon Fryer in his season announcement as “four girls in residence at the Curtis Institute,” in a program of “how young composers grappled with the past.” It’s comprised of early Beethoven (Op.18 No.6), American Caroline Shaw’s Blueprint (2016), Webern’s late-Romantic Langsamer Satz and Mendelssohn’s String Quartet No.2 in A Minor Op.13, written in 1827, just months after Beethoven’s last quartet when Mendelssohn was just 18. Then, on May 4 it’s Charles Richard-Hamelin’s turn to shine. The WMCT can be justifiably proud of their prescience in awarding pianist Richard-Hamelin their Career Development Award in April 2015. Only a few months later he became the silver medalist and laureate of the Krystian Zimerman award for the best sonata at the International Chopin Piano Competition. Take advantage of his first Toronto full-fledged solo recital since then, to hear this 27-year-old Canadian whose pianism exhibits the musicianship and maturity of a more seasoned artist. His program includes an early Schubert sonata, Chopin’s captivating Impromptus and Scriabin’s Op.8 and 9, works which owe much to Chopin. Lucas Debargue and the TSO. The Tchaikovsky 2015 Competition keeps on giving. In the last year Show One has presented three of its prizewinners at Koerner Hall: a unique joint recital of runner-up Lukas Geniušas and Moscow Music Critics Association prizewinner Lucas Debargue last spring was followed by the Tchaikovsky Competition first-place finisher, a polished and secure Dmitry Masleev, in March 2017. Meanwhile on December 7, 2016, the TSO and a soulful Geniušas performed Tchaikovsky’s Piano Concerto No.1. Now, Debargue will join Andrey Boreyko and the orchestra for a performance of Liszt’s poetic Piano Concerto No.2 in A Major, April 12 and 13. Apr 2: Since my article in our March issue on the Church of the Holy Trinity’s Piano Bravura series, 18-year-old Tony Yike Yang has been selected as one of the 30 competitors (and the youngest) for the 15th Van Cliburn International Piano Competition. Don’t miss this opportunity to hear him before he heads down to Fort Worth TX in May. His formidable program includes Mussorgsky’s Pictures at an Exhibition and Chopin’s “Funeral March” Sonata. Apr 23: Sheng Cai’s piano recital on Holy Trinity’s Steinway includes two Scarlatti sonatas, Mozart’s K332, Chopin’s Barcarolle, Schumann’s Humoresque Op.20 and Villa Lobos’ Rudepoêma, written for Arthur Rubinstein. Apr 2, 4, 5, 7, 8: The ever-resourceful Kitchener-Waterloo Chamber Music Society presents the Lafayette String Quartet playing the complete string quartets of Shostakovich. Then, Apr 30, KWCMS’ season continues with a recital by the American colourist Eric Himy featuring his own piano arrangements of Debussy’s Prélude à l’après-midi d’un faune and Gershwin’s An American in Paris and Rhapsody in Blue. And on May 6, the Cecilia String Quartet’s Music Room recital juxtaposes works by Kati Agócs and Nicole Lizée with Franck’s expressive Piano Quintet in F Minor (Leopoldo Erice, piano). Apr 4: COC’s free noontime concert series features violinist Mark Fewer in “Partita Perfection.” Apr 5: The series continues with Rossina Grieco in “Piano Panache.” Apr 11: The COC Orchestra brass play works by Poulenc and Salonen. Apr 20: “Join the siblings of the Métis Fiddler Quartet on a musical voyage across the trade routes of the Northwestern frontier. Clap, jig and sing along with this award-winning group and discover the history of the Métis people in Canada through fiddle tunes and songs passed down by elders from across the country.” May 2: The COC Orchestra winds play works by Haydn, Beethoven and Jacob. May 4: Members of the COC Orchestra perform Schubert’s masterful Octet. Apr 7: Bravo Niagara! presents Jon Kimura Parker in Beethoven’s formidable Appassionata Sonata, Ravel’s shimmering Jeux d’eau, Alexina Louie’s Scenes from a Jade Terrace and two movie-themed pastiches by William Hirtz: Bernard Herrmann Fantasy and Fantasy on The Wizard of Oz. Apr 8: Gemma New leads her Hamilton Philharmonic in music by Beethoven, Mozetich (with solo harpists Erica Goodman and Angela Schwarzkopf) and Mendelssohn. May 6: Lara St. John joins New and the orchestra as soloist in Korngold’s Violin Concerto. The concert also includes two orchestral favourites: Strauss’ Don Juan and Stravinsky’s Petroushka. Apr 9: Pocket Concerts presents a diverse, exciting program featuring co-artistic director, pianist Emily Rho. After a Glass étude (No.8) and a Mozart sonata (K310), Rho takes a break while a high-powered wind quintet performs Ligeti’s compelling Six Bagatelles; then she joins them for Poulenc’s highly addictive Sextet for Piano and Wind Quintet Op.100. Apr 9: Les Amis presents Lynn Kuo, violin, Winona Zelenka, cello, and Rachael Kerr, piano, performing Schulhoff, Oesterle, Pepa and Dvořák’s charming “Dumky” Trio Op.90, in Cobourg. Apr 9: The Royal Conservatory presents the eminent pianist Louis Lortie performing Chopin’s Études Op.10 and 25 and Preludes Op.28. Apr 28: RCM presents the Montrose Trio (Jon Kimura Parker, piano; Martin Beaver, violin; Clive Greensmith, cello; the latter two are former members of the disbanded Tokyo String Quartet) and friends (Barry Schiffman and Erika Raum, violins; Teng Li and Sharon Wei, violas; Desmond Hoebig, cello; and Allyson McHardy, mezzo-soprano) in a program that includes Brahms’ Piano Trio No.1 and Alto Songs, plus Tchaikovsky’s memorable Souvenir de Florence. Apr 12: The Bata Shoe Museum presents the effervescent Quartetto Gelato. Apr 16: Chamber Music Hamilton brings Quatuor Danel to Southern Ontario, a rare visit to North America for this Belgian-based quartet that is considered by some as the heirs to European quartets such as the Beethoven and Pro Arte, with whose surviving members they studied. Apr 16: The Rosebud String Quartet, featuring COC Orchestra principal violist Keith Hamm (founder and artistic director of the Rosebud Chamber Music Festival in Rosebud, Alberta, his hometown) and COC Orchestra associate concertmaster/National Ballet Orchestra concertmaster Aaron Schwebel, performs Haydn and Schumann in historic Campbell House. Apr 21: Remenyi House of Music presents Russian-born, British-based pianist Amiran Zenaishvili in a recital devoted to the music of Brahms. Apr 21: TSO piccolo Camille Watts and COC/National Ballet Orchestra piccolo Shelley Brown join forces for Gallery 345’s The Art of the Flute, with a little help from their friends Erin Cooper Gay, Aaron Schwebel, Keith Hamm and Britt Riley. Apr 29: The Art of the Flute continues with RCM faculty-member Sibylle Marquardt and her friends Fraser Jackson, Monique de Margerie, Paul Pulford and Michael Donovan. Apr 21: In the penultimate concert of Jeffery Concerts’ two-year traversal of the complete Beethoven Quartets, the New Orford String Quartet performs Op.18 No.3 and No.5, and Op.135; Wolf Performance Hall, London. Apr 21, 22: Virtuoso German-Canadian cellist Johannes Moser joins Edwin Outwater and the Kitchener-Waterloo Symphony in Dvořák’s grand Cello Concerto in B Minor Op.104; Brahms’ glorious Symphony No.3 in F Major Op.90 completes the program. May 5, 6: Soprano Measha Brueggergosman and pianist Stewart Goodyear lend their star power to “Edwin’s Pops” as Outwater leads his orchestra in PDQ Bach’s hilarious take on Beethoven’s Fifth and other musical jokes. Apr 22: Estonian cellist Aare Tammesalu is the soloist for Dvořák’s ever-popular Cello Concerto in B Minor Op.104, the centrepiece of Cathedral Bluffs’ “Annual Fundraising Concert and Silent Auction,” which also features the composer’s beloved Symphony No.9 “From the New World,” led by Norman Reintamm, who also happens to be Tammesalu’s pianistic chamber music partner in Trio Estonia. 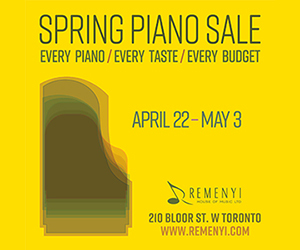 Apr 22, 23: Honens’ 2015 Laureate Luca Buratto is the soloist in Mozart’s Piano Concerto No.25 in C Major K503; RBC resident conductor Earl Lee also leads the TSO in Mendelssohn’s exuberant Symphony No.4 “Italian.” Apr 27: Buratto, whose first disc for Hyperion will be released later this year, gives a solo recital at the Aurora Cultural Centre. Apr 23: Georgian Music presents the Cecilia String Quartet in Schubert’s great “Death and the Maiden” String Quartet; Leopoldo Erice adds his pianism to Franck’s expressive Piano Quintet in F Minor. Nadia Boulanger once said it contains more ppp and fff markings than any other chamber piece. Apr 27: The Eybler Quartet’s Heliconian Hall recital, which includes classical stalwarts Mozart’s String Quartet in E-flat Major K428 and Haydn’s String Quartet Op.20 No.2 in C major as well as two early quartets by Johann Baptist Vanhal, is also a CD-release concert for the group’s new disc of Vanhal’s Quartets Op.6 Nos.1-6. Apr 29: TSO principal horn Neil Deland brings his ravishing sound to Brahms’ Horn Trio with pianist Peter Longworth and Trio Arkel violinist Marie Bérard. The program concludes with Brahms’ Piano Quartet No.2 in A Major Op. 26 with Trio Arkel violist Teng Li and cellist Winona Zelenka joining Bérard and Longworth. Apr 29: Günter Neuhold conducts the Ontario Philharmonic in an all-Mozart program. Maria Sourjko is the soloist in the ineffable Piano Concerto No.21 K467; Jean Desmarais takes the keyboard in the delightful Piano Concerto No.17 K453. The exhilarating Symphony No.35 in D Major K385 “Haffner” concludes the evening. Apr 30: Amici Chamber Ensemble (Joaquin Valdepeñas, clarinet, David Hetherington, cello, and Serouj Kradjian, piano) is augmented by violinist Jonathan Crow in a program that begins with Arvo Pärt’s heavenly Spiegel im Spiegel and ends with Olivier Messiaen’s ethereal Quartet for the End of Time; in Mazzoleni Hall. Apr 30: Nocturnes in the City presents Slávka Vernerová-Pěchočová, a pupil of the great Ivan Moravec, playing piano music by Janáček, Schumann and Smetana. May 6: The Haliburton Concert Series presents the inimitable duo of Guy Few, piano/trumpet, and Nadina Mackie Jackson, bassoon, performing works by Dutilleux, Beethoven, Buhr, Rossini and Paganini. "Not Reconciled: The Cinema of Jean-Marie Straub and Danièle Huillet” is a retrospective of 31 films by the singular filmmaking duo that takes hold at TIFF Bell Lightbox March 3 with the screening of a new 35mm print of Chronicle of Anna Magdalena Bach. Whether or not you’re familiar with the austere dissociation of the filmmakers’ style, this black and white 1967 film is essential viewing for any music lover. Compulsively watchable, it’s of key historical importance on two counts. As a portrait of J.S. Bach, it’s a focused biography zoning in on the last decades of his life, from the end of his stint working for Prince Leopold of Anhalt-Köthen to his time in Leipzig as cantor of St. Thomas Church (1723-1750). And as a 50-year-old film in which Bach is portrayed by harpsichordist Gustav Leonhardt and the music is directed by Nikolaus Harnoncourt with musicians from his Concentus Musicus Wien, it’s also a record of a period-instrument movement that was then in its infancy. The film is awash in music, all inspired by Bach’s love of, and devotion to, God. Almost the entire film consists of excerpts from 24 of Bach’s works – it’s a total immersion experience largely because most of the excerpts are each several minutes long. The bewigged Bach and musicians perform in period costume in the very places where the compositions were first played. The Straubs’ rigorous aesthetic reinforces this effect by selecting a camera position with a striking perspective and letting their unmoving camera soak up the moving image; they concentrate our attention on the music. The film is narrated in a matter-of-fact manner by Bach’s second wife, a singer he married in 1721 after the death of his first wife. She gives a bare outline of Bach’s early years, touching on his organ prowess and the famous 250-mile walk he took from Arnstadt to Lübeck to hear his idol Buxtehude play, but once she introduces herself events flow according to the pulse of time. For the most part the music follows in chronological order beginning with a sizable excerpt from the middle of the first movement of the Brandenburg Concerto No.5, the first great keyboard concerto and arguably the zenith of his time in Köthen. The camera placement is over the right shoulder of Bach as we watch Leonhardt play his double-keyboard harpsichord unfettered. Just as Bach is about to take up his post in Leipzig, we’re treated to Leonhardt and Harnoncourt in lovely performance of the first movement adagio from the Sonata No.2 for viola da gamba and harpsichord BWV 1028. Then it’s a seamless parade of cantatas (embracing many instrumental passages, Bach conducting from the keyboard) with the Magnificat, St. Matthew Passion and Mass in B Minor included, all integral to the narrative. Only a smattering of keyboard works interrupt the flow, notably the opening of the magisterial Prelude in B Minor for Organ BWV 544. Later, the camera actively moves in on Leonhardt for an intimate snippet of the Clavier-Übung organ chorale. He explains how his left hand plays written notes (basso continuo) while the right hand plays in consonance and dissonance; and that the music is for the glory of God. Camera placement is critical. For example, in the Cantata BWV 198, written for the funeral of Queen Christiane, the vantage point is from the instrumental side focused on the lute, with Bach at left in front of the choir. Occasionally there will be a cut to a close-up of a singer or instrumentalist; even a view of the thick scores black with the density of notes. Despite the lack of camera movement, there is a variety of perspective, often at an angle, which adds to our involvement. The filmmakers also point us to original documents, contracts and the like. They are careful to point out the economics of Bach’s daily life and his concerns with his working conditions as he navigates his relationship to his employers. The other major musical component of the retrospective, is the screening March 12 of the Straubs’ film of Schoenberg’s unfinished opera Moses and Aaron (1974), shot in a Roman amphitheatre with the Austrian Radio Choir and Austria Radio Symphony Orchestra (recorded in Vienna), along with the 1972 short film Accompaniment to a Cinematic Scene (which uses text by Schoenberg and Brecht to condemn anti-Semitism). Preceding the films will be a 15- to 20-minute live performance of five extracts from Schoenberg’s Pierrot Lunaire as well as Claude Vivier’s Hymnen an die Nacht presented by Against the Grain Theatre with soprano Adanya Dunn and collaborative pianist Topher Mokrzewski. Associates of the TSO. Now in their 45th season, the Associates of the Toronto Symphony Orchestra continue their current series March 6 with “Classics of Vienna Meet Voices of Britain.” TSO oboist Sarah Lewis is joined by Eri Kosaka, violin, Diane Leung, viola, and Emmaneulle Beaulieu Bergeron, cello, in Mozart’s effervescent Oboe Quartet K370, Britten’s Phantasy Quartet for Oboe and Strings Op.2 (written when the composer was 19 and featuring a singing oboe line). Beethoven’s splendid Trio Op.9 No.1 opens the concert. On February 13, I heard their second concert of the season, “Paris en mille notes,” a delightful evening of chamber music in the friendly confines of Jeanne Lamon Hall. The distinctive Gallic-flavoured program began with a lively look at Stravinsky’s Suite from L’Histoire du Soldat. Stravinsky’s septet consisted of violin, clarinet, bassoon, trumpet, trombone, double bass and percussion, a larger number of players than the Associates usually bring to a concert. The enthusiastic audience, who appeared to be made up of the proverbial “seven to seventy,” took up most of the seats on the main floor and seemed to energize the players. Stravinsky’s score, which takes advantage of its instruments’ unique instrumental colour, was suitably raucous and lively with memorable violin playing by TSO assistant concertmaster Etsuko Kimura (as it should be given the story of a violinist-soldier who sells his instrument to the devil), the sweet bassoon of Fraser Jackson and buffoonery from the brass. Poulenc’s Sonata for Flute and Piano, which followed, acted as a palate cleanser after the Stravinsky’s exoticism, creating a wonderful sense of space with long flute lines and wide intervals that felt very French, all delivered with aplomb by Leonie Wall and collaborative pianist Monique de Margerie. After intermission the duo joined the septet plus another percussionist for Jackson’s clever chamber arrangement of Ravel’s Piano Concerto in G Major which was being performed for the first time. With similar instrumentation as the Stravinsky, the concerto began in wind-band style before moving into its languorous piano theme with piccolo backing. Conductor Ryan Haskins brought a subtle baton to Ravel’s jazz touches, providing a good steady groove for the second movement’s lovely theme, while de Margerie’s intimate solo piano playing was well-suited to the chamber format. Kudos to the musicians and their contagious spirit. It augurs well for the rest of the season to come. Following the March 6 concert previously mentioned, their season continues May 29 with a transcription of Schubert’s song cycle Die schöne Müllerin arranged for violin and viola and Beethoven’s String Trio in E-flat Major Op.3. June 5, it’s music for piano trio by Haydn, Luedeke, Piazzolla and Brahms. Dmitry Masleev. Following in the footsteps of the 13 first-place winners of the International Tchaikovsky Competition, the Siberian-born Dmitry Masleev joins such legends as Van Cliburn (1958), Vladimir Ashkenazy (1962) and Grigory Sokolov (1966) and most recently Denis Matsuev (1998), Ayako Uehara (2002) and Daniil Trifonov (2011). His Koerner Hall recital March 22 includes works he played in Round 1 of that competition (two of Rachmaninoff’s Études Tableaux Op.39 and Beethoven’s Sonata Op.81a “Les Adieux”) and Liszt’s Totentanz from Round 2. Four Scarlatti sonatas, additional Rachmaninoff pieces and Prokofiev’s Sonata No.2 in D Minor Op.14 complete his ambitious program. In response to a question I emailed him shortly before we went to press, Masleev told me that his musical hero is Sergey Rachmaninoff. “He was not only a genius composer whose music inspires all classical music lovers, but he was also a brilliant pianist,” he said. “Thank God we have lots of his recordings available and can listen to them. “He has his own style of performing,” the 28-year-old said. “You will always be amazed by his precise touch, deep forte and piano, and of course, just incredible technique. His music combines deep meaning that touches your heart, a variety of harmonies, just unbelievable beautiful melodies. There is a quality in it that will find a response from any person in the audience. Mar 4: Hamilton Philharmonic Orchestra principal trumpet Michael Fedyshyn joins violinist Bethany Bergman, cellist Rachel Mercer and pianist Angela Park as 5 at the First presents music by Biber, Barnes, Ewazen and Piazzolla. Mar 4: Academy Concert Series presents “A Frankly Fabulous Foray,” piano quintets by Franck and Fauré (See what they did there! ), two lush chamber works. OSM principal second violin Alexander Read, HPO second violinist and Windermere String Quartet first violinist Elizabeth Loewen Andrews, TSM 2016 fellow Emily Eng, viola, Academy Concert Series artistic director Kerri McGonigle, cello, and Leanne Regehr, piano, bring the works to life. Mar 5: Trio Con Brio Copenhagen’s concert, presented by Chamber Music Hamilton, includes Schubert’s uncommonly beautiful Piano Trio in B-flat Major Op.99. Mar 5, 7 and 9: The Kitchener-Waterloo Chamber Music Society presents the Aviv String Quartet performing Mozart’s great last ten quartets. Mar 21 and 23: Movses Pogossian honours Bach’s birthday by playing his six sonatas and partitas for unaccompanied violin in the KWCMS music room. Mar 22: Peter Vinograde, who played the first solo recital in that music room in 1980, returns to play Bach, Beethoven and Peter Mennin. Apr 2, 4, 5, 7 and 9: Another major programming coup for KWCMS: the Lafayette String Quartet playing the complete Shostakovich string quartets. Mar 5: It’s cloning time as Mooredale presents Paganini Competition prizewinner In Mo Yang at Walter Hall, while RCM presents the inimitable Sir András Schiff at Koerner Hall, and Roy Thomson Hall presents Andris Nelsons and the Boston Symphony Orchestra, recent Grammy winners for Best Orchestral Performance. All concerts will take place Sunday afternoon at three o’clock. Mar 7: GGS scholarship student Charissa Vandikas plays Chopin, Schumann and Rachmaninoff in a free noon-hour concert at the Richard Bradshaw Amphitheatre. Apr 4: Another COC free noontime concert features Mark Fewer in solo violin works by Bach, Ysaÿe and Chris Paul Harman. Apr 5: Rossina Grieco, a native of Southern California and winner of the GGS Ihnatowycz Prize in Piano, fills the Bradshaw Ampitheatre with Liszt’s iconic Sonata in B Minor in her free concert. Mar 9: The relatively new Trio Shaham Erez Wallfisch brings their chamber music bona fides to the Women’s Musical Club of Toronto for what promises to be a memorable afternoon of music by Rachmaninoff, Schumann and Shostakovich. Mar 10: The celebrated duo pianists, Anagnoson and Kinton, continue their 40th anniversary season with a concert at Brock University in St. Catharines. Mar 16: Music Toronto presents the Philharmonic Quartett Berlin (made up exclusively of members of the Berliner Philharmoniker) in a classic program of late Haydn, early Beethoven and middle Schumann. Mar 18: TSO concertmaster Jonathan Crow is the soloist in Brahms’ lyrical Violin Concerto with the Niagara Symphony Orchestra conducted by Bradley Thachuk, at FirstOntario Performing Arts Centre in St. Catharines. Mar 23: One-time protégé of the great Arthur Rubinstein, Janina Fialkowska brings her pianistic sensibility to an all-Chopin recital at the Aurora Cultural Centre. Mar 27: The U of T Faculty of Music presents the dedicated and dependable Gryphon Trio performing Beethoven’s buoyant Piano Trio Op.11, Dinuk Wijeratne’s Love Triangle and Brahms’ romantic signpost, the Piano Quartet No.1 in G Minor Op.25. Currently artists-in-residence at the faculty, the Gryphon is joined by guest violist Ethan Filner for the Brahms. Apr 1: The indefatigable Angela Park joins Canadian Sinfonietta’s first violinist, Joyce Lai, and first cellist, András Weber, for an evening of chamber music by Rachmaninoff, Handel-Halvorsen and An-Lun Huang. Apr 1, 2: Tokyo-born, Montreal-raised Karen Gomyo brings her superb musicianship to Beethoven’s splendid Violin Concerto. Young American, Robert Trevino, also conducts the TSO in the 1947 version of Stravinsky’s Petrushka rooted in Russian folklore and melody. Apr 6, 7: TSO favourite Thomas Dausgaard returns to conduct Deryck Cooke’s version of Mahler’s magnificent Symphony No.10; TSO principal cellist Joseph Johnson is the soloist in Schumann’s ravishing Cello Concerto in A Minor Op.129, the opening work on the program. Apr 2: Pianist Anton Nel, fresh from two masterclasses on March 31, performs Mozart and Schumann in a free concert (tickets required; available from March 2) in Mazzoleni Hall. Apr 7: Bravo Niagara! Festival of the Arts presents pianist Jon Kimura Parker in a fascinating program comprised of Beethoven’s formidable Appassionata Sonata, Ravel’s shimmering Jeux d’eau, Alexina Louie’s Scenes from a Jade Terrace and two movie-themed pastiches by William Hirtz: Bernard Herrmann Fantasy and Fantasy on the Wizard of Oz.